TAYLORSVILLE – If you were looking for tight, down-to-the-wire finishing and exciting basketball Friday night, the Class 4A state girls basketball semifinals was not the place to be. 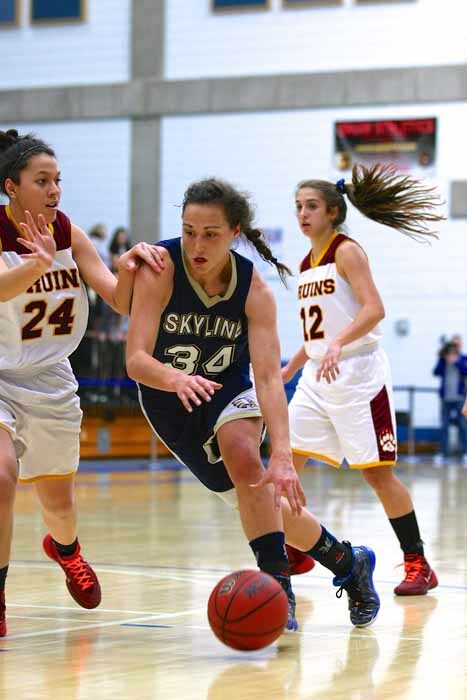 There was no drama, just a pair of blowouts, as Skyline and Sky View advanced to the state championship game, which tips at 11 a.m. Saturday at Salt Lake Community College. Lacking a fantastic finish, here are a few of the top stories from Friday’s 4A action and some things to look for come Saturday. 1) Blowouts – Both games got out of hand and were decided long before the fourth quarter rolled around, but it happened in different ways. Sky View took care of Mountain View in the second stanza and finished the Bruins off in the third. Even at the beginning of the game, things did not look good for Mountain View, as the Bobcats scored the first seven points of the contest. The Bruins answered that time, getting within two points by the end of the opening period. Sky View held Mountain View to three points in the second quarter, and outscored the Bruins 14-2 over the first four minutes of that period. The Bobcats led 25-11 at intermission and then had a 22-8 advantage in the third to end all doubt, cruising to a 65-45 win. The second 4A game was close and low-scoring throughout the first half, but Skyline went on a 17-2 run to begin the third period and that was the last time Maple Mountain was within hailing distance as the Eagles shot 65 percent from the field in the second half on their way to a 56-39 victory. 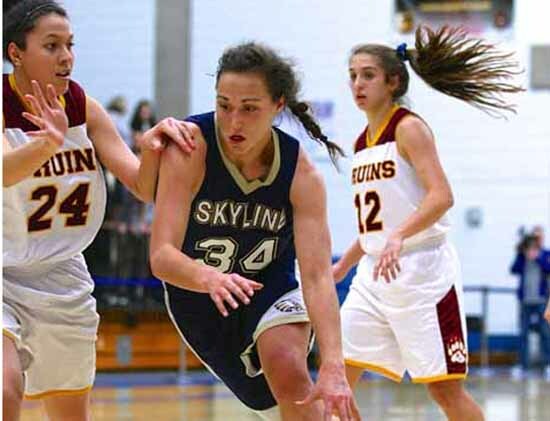 2) Olivia Elliss vs. Liz Eaton – As she has done in previous games, Skyline’s Olivia Elliss took on the major responsibility of the night, guarding Maple Mountain junior Liz Eaton. Eaton went off for 29 points Thursday in leading the Golden Eagles past previously unbeaten Bountiful. Elliss was physical with the junior guard and gave Eaton no room to operate. The result was a 1-for-11 shooting night (0-for-5 from the 3-point arc). Eaton finished with nine points and eight rebounds in the game, but that was only through some late free-throw shooting. With Eaton unable to get going, MiKayla Hubbard tried to makes up some of the different on the inside, but eventually Maple Mountain just fizzled out and fell short. 3) Lindsey Jensen again – It was another night on which Sky View forward Lindsey Jensen was not needed much after the third period, yet she still finished with 22 points and nine rebounds. If the Bobcats are able to finish off their undefeated season and title run Saturday, Jensen is already a lock as the tournament’s top player. The matchup that sets up for Saturday would pit Elliss’ defense against Jensen’s scoring. 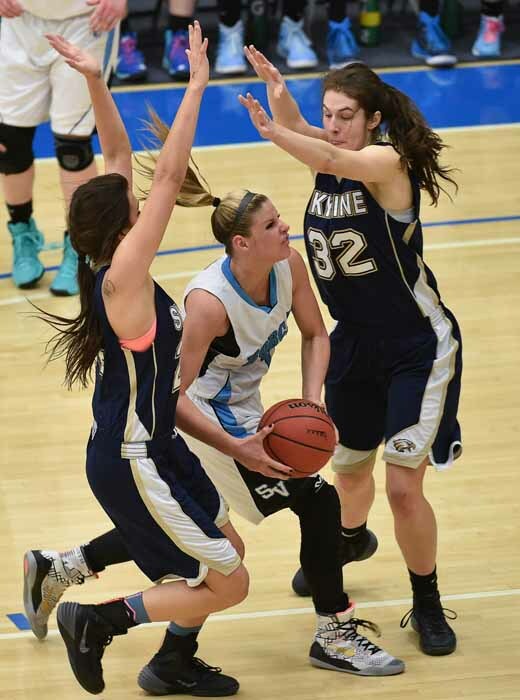 Can the Skyline senior forward harass Jensen into an off night without fouling her. The greatest difficulty in guarding Jensen is her accuracy from the charity stripe. If you foul her, she is all but automatic from there. 4) Saturday’s championship set-up – Stopping Jensen has to be the top priority for Skyline Saturday. Way back in November, Skyline met Sky View in a game that went overtime and resulted in a one-point victory for the Bobcats. This one could be very similar. Skyline will drive to the rim, particularly Elliss and forward Hillary Weixler, and the Eagles will look to use their inside advantage to break Sky View down in the paint. If that succeeds, it should be a good day for the Eagles. The Bobcats, on the other hand, will lean on Jensen as they usually do, and she will look to create shots for herself and also for her teammates. Sky View will also hope to force turnovers and get out into transition to keep the tempo up and make the Eagles play faster than they can be successful. It is likely that Skyline will look to keep it physical and to get into a half-court game as often as possible, while Sky View would prefer to speed it up as often as it can, using defense and transition offense to put the Eagles on their heels. A classic clash of styles, this is an intriguing championship battle.